The weekend is here, and I’m so very excited to be sharing with all of you my Friday’s Vintage Cocktail blog post! On Friday’s I share a fabulous true vintage or vintage inspired cocktail with you all to celebrate the weekend being here! As always please be sure to drink responsibly and if any younger readers come across this, be sure to abide by your states drinking laws. My honeymoon was truly beautiful, while on our cruise cocktails were quite reasonably priced so I definitely indulged in all of the deliciousness I could. There were many bars and lounges to explore, but one of my favourites was the Crooners Bar located on the seventh floor of the ship, being the top of the piazza area which was a sight to hold. It featured beautiful embellishments on the walls of jazz bands, with a beautiful vintage bar, and overnight featured talented performers. The drinks menu was just incredible, with stuffed olives served with you drink it was a fabulous experience. One of my favourite cocktail on their menu at Crooners was the Flamingo, so I thought I’d concoct my own recipe to share with you all so that you can all enjoy with me as a reminisce about my honeymoon. 1/2 a cup of apple juice. 1 addition melon slice to garnish. In a blender add all ingredients minus any garnishing fruit and blend until smooth. Serve in a beautiful martini glass and garnish how you please. Revel in the delicious drink while listening to some big band tunes. This cocktail will always have a special place in my heart as it will always take me back to the time we were newlyweds on an adventure, but it is truly delectable! It’s a light and fluffy drink with fruity flavours from the apple juice and fresh watermelon, for me I can’t taste liquor at all which is definitely my kind of drink! This drink could easily be made in a larger quantity for parties, I think it would be fabulous for an afternoon soiree or another glamorous affair. I hope you’ve all had a wonderful week, and I wish you a fabulous weekend. 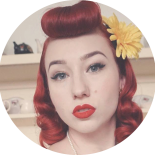 This entry was posted on December 2, 2016 by Miss Lady Lace in Friday’s Vintage Cocktail, Pinup and tagged 1940's, 1950's, 2016, australia, blog, blogger, friday’s vintage cocktail, glamour, Lady Lace, miss lady lace, miss lady laces pinup blog, nicole, perth, perth burlesque, perth pinup, perth pinup blog, perth pinup community, pin up, pinup, pinup blog, pinup blogger, pinup fashion, pinup girl, pinup life, pinup lifestyle, pinup perth, red lips, retro blog, retro girl, retro glamour, the perth pinup community, victory rolls, vintage, vintage blog, vintage blogger, vintage fashion, vintage girl, vintage glamour, vintage perth, vintage pinup blog.